How it all began... 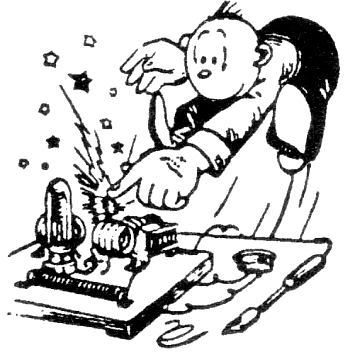 I had my first (electrically) shocking experiences when I was about four years old, in my hometown of Voorburg, The Netherlands. Somehow a small radio set had been put at my disposal. In those days, the power plugs were still unprotected: you could touch the prongs even when the plug was (still) partially inserted into a power outlet and "alive". For decades now, only the tips of such prongs are allowed to be conductive (in countries like the US such protection doesn't exist, maybe because they only use 110 volt). Anyway, for some reason I couldn't fully unplug the power plug. So it made complete sense to me to stick two little fingers between the plug and the outlet, to get more leverage. Sure enough.....zap!! That hurt all the way up my arm for hours! At some point during its life, this dark brown (bakelite?) radio had lost its cardboard rear cover. How interesting, those glowing glass tubes. I wonder what that thingy is over there.... Let's touch it! ... zap!!! Luckily for the world and myself, this has never deterred me from pursuing interests in electricity and electronics, or prevented me from having other shocking experiences. In those infant days I still had fun with dollhouse electricity: small flashlight light bulbs and sockets, batteries, tiny pushbuttons, etc. Mechanical construction also caught my interest. As did de-construction. Obviously I needed a collection of small screws. I got some by unscrewing name plates of the neighbors in our apartment building, and replacing the screws with matchstick stubs (I was forced to reverse these acquisitions shortly thereafter). My technical endeavors needed to be, and were, rewarded on my 6th birthday: I got a Philips ME1200 Mechanical Engineer experimentation kit, in a nice wooden box. One of my most favorite presents ever! I must have been at least seven or eight years old when my father helped me solder together a rudimentary crystal set. 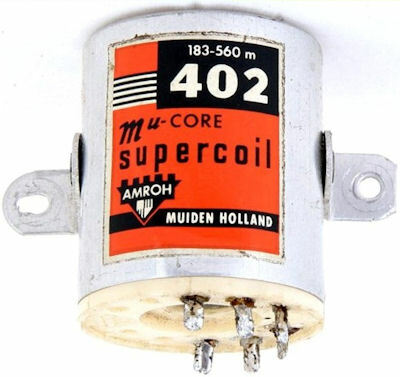 It contained the venerable Amroh-402 "mu-core supercoil". This universal coil was very popular in many designs, from crystal sets to "real" MW radios. It could be used at the input stage, as well as in oscillator circuits and IF-stages. Its 902 and 932 cousins were used for LW and SW. The 402 has not been manufactured for many years, but a new, smaller equivalent is available here. The parts for my first electronics project were bought at a small and shady electronics shop in de Wagenstraat (not "Kontakt") in Den Haag (The Hague). Later on, I tried to get rid of the crystal earphone (very uncomfortable) by hooking up the crystal set to a small audio amplifier (built with parts from the same store). No go! The kind old man in the shop suggested putting an electrolytic capacitor between the two, and voilà, success: the offshore pirate station "Radio Veronica" now came out of a little speaker! That speaker later got fried by my brother. We were setting up our Märklin train set, and he wanted to plug the transformer into the extension cord. I had used a salvaged power plug rather than a loudspeaker connector for my speaker. The little speaker may have been able to produce a 50 Hz sound. But as you can image, it did not work for very long on 220 volt. It's service life came to a sudden, quick, noisy, and flashy death that popped the fuse. I was crushed! My dad's brother, uncle Piet, gave a small chassis with an LW/MW/SW receiver that he had built in the 1950s. It was a "Mk III" radio per a design in "Jongens Radio - Part 1". It had three tubes (6K7, VR53, 6V6; substitutes for the tubes called for by the original design). It also sported an Amroh-902 and -932 coil, cousins of the 402 coil mentioned above. Leo, one of the kids I knew from school, was an active "pirate" in the 3 meter band (100-108 MHz, as that part of the FM band was not yet used by broadcast stations). 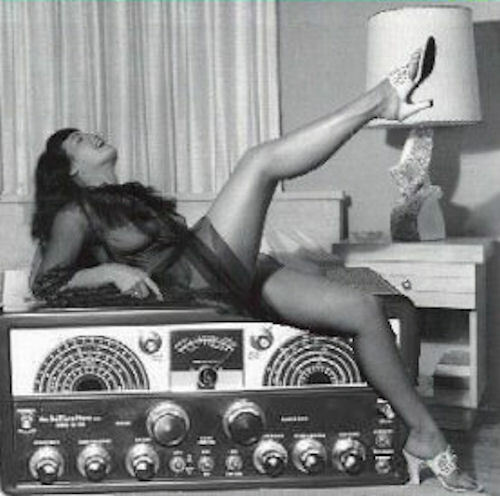 That was cool, and I eventually got my own little transmitter (with a 2N2219 transistor) that I ran on two 4½ volt batteries; today you might call it a "wireless microphone on steroids". A regular FM-band dipole antenna was pruned for the 3 meter FM-band and attached to the balcony of my brother's bedroom. Clearly this activity was illegal, but it was fun! To paraphrase Alexander Woolcott (1887-1942): "All good things in life are either immoral, illegal, or fattening". Transmissions had to be limited to reduce the chance of getting caught by a special service of the national PTT: the Radio Opsporingsdienst (the Radio Detection Service). Many did get caught. The head of that service was the feared Mr. Neuteboom. But for some strange reason, his son (one of the high-power pirates in our region at that time, operating from his parent's house) never got caught... Had most of my contacts with a kid about two kilometers away - he kept a (noisy) live duck in his bedroom. Disgusting! Have forgotten his pirate name "callsign"; mine was "Condor". It was probably Christmas one year (could have been a birthday) that my Philips ME1200 kit was complemented with the Philips EE1003 Electronic Engineer experimentation kit. The idea was not bad. But it turned out to be a relatively frustrating experience. I could not get many of the designs to work, other than the electronic organ / Morse sounder. I do think that I followed the instructions... (never been one of my strong points in life though). An important skill to be acquired, is determining whether a soldering iron is hot (enough). There are several ways to do this: 1) try to melt a piece of solder – this is just too obvious; 2) touch the tip of the soldering iron to the wet sponge that's in the soldering iron stand, and check for sizzling – watering the sponge is a hassle; 3) use the "candle sniffer" method: wet the tip of your thumb and index finger with saliva, and briefly (!) squeeze the tip of the soldering iron – this requires expert timing; there are plenty of other opportunities to burn your finger tips during soldering jobs, and there is no need to add one; 4) hold the soldering iron parallel to your face, just below your nose, and judge the hot air rising from the business-end of the iron. I have used all of these methods with success. By the way, soldering is a technology that goes back at least 4500 years, to the cradle of civilization that is currently referred to as Iraq. Thus, it it one of the many "second oldest professions in the World". Ger, the son of my parents' friends, had a 27 MHz base rig, walkie-talkies (more correctly referred to as handy-talkies) and a large ground-plane antenna. This too was beyond the legal limits in those days. It was obvious that CB-ing was not a serious matter, and many of the CB-ers that I listened to appeared to have an IQ that approached the frequency (in MHz) that they operated on. In 1975 the Timmermans family kindly gave me a BC-224-F receiver. The BC-224 family of receivers (models A-L) was built from 1936-1953 by the Radio Corp. of America (RCA), and Belmont Radio Corp. The F-model (by Belmont) was not intended for (air)mobile operation. Hence, it did not have a 12 volt dynamotor but a regular power supply. It was intended for 110 volt, and the power supply had been fried by hooking it up to 220 volt. Via "aunt Francis", a friend of my parents, I ended up in the radio repair shop of the local airbase (Ypenburg). They provided me with a copy of a BF224/BC348 maintenance manual, had a general look at the radio, and tested some tubes. 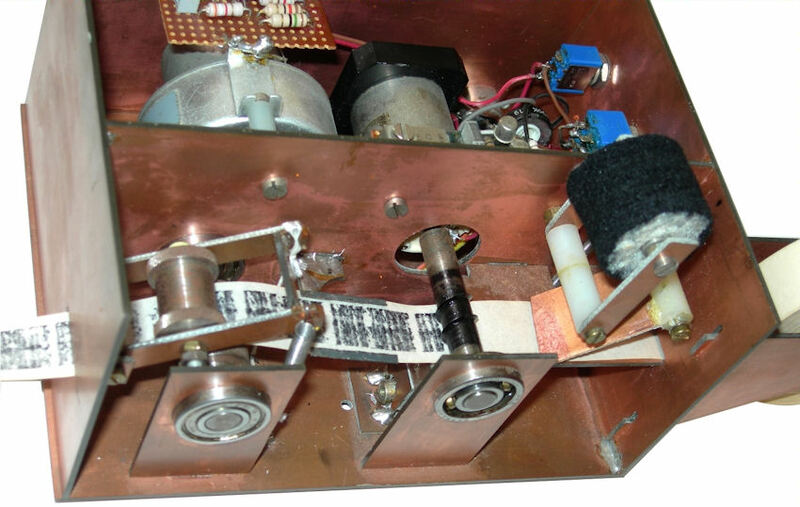 The schematic and descriptions in "Das Surplus Handbuch" also was a big help; I made a new power supply (first with a "modern" diode-tube rectifier, later solid-state), replaced a tube and some capacitors, and tuned all RF and IF stages. Without appropriate tools at my disposal, this was simply done by tuning for max volume of received signals. For many years I used it almost daily for short wave listening ("SWL-ing"), both amateur and broadcast radio. Ten feet of wire strung along the ceiling had to do as antenna. Good sources of BC-348/BC-224 information are here (James Moorer), here (KF6NUR), here (NF6X), here (Bo Samuelsson), and here (manual). Apparently, these receivers did not come cheap: "In 1943, the approximate cost of a complete BC-348-Q was $368 -- almost 18 times the $21 monthly base pay of an Army private". In 1947, they were sold to the general public as surplus for $69.50 (per advertizing in QST of November of that year), and prices went up to $149.50 (per an ad in CQ magazine of January of that year). 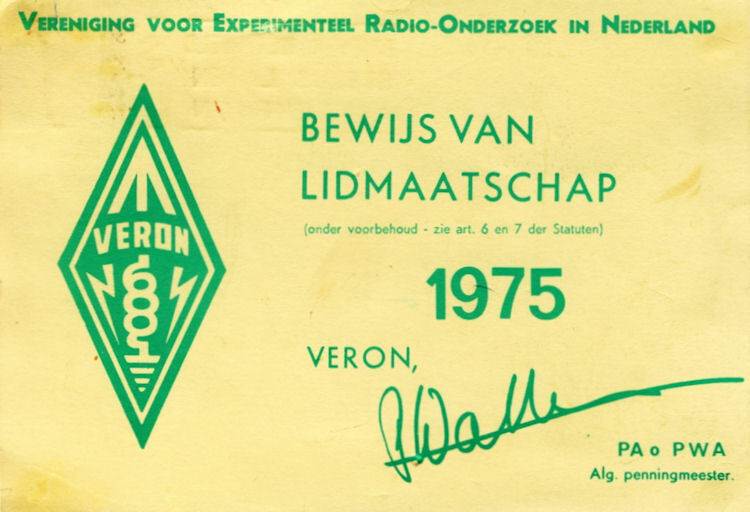 At some point I joined the VERON (Vereniging voor Experimenteel Radio Onderzoek Nederland, one of the two amateur radio societies in The Netherlands), got my SWL "callsign" (NL-4922) and engaged in SWL-ing. The VERON membership includes a subscription to the monthly club magazine "Electron". Lots of neat stuff, and I always looked forward to the magazine dropping in our mailbox. Occasionally I went to the weekly meetings at the local VERON-chapter in The Hague. Thought about taking their Morse code course, but never got around to it. What really peaked my attention was an article by Hans, PAØCX, in the June 1977 issue of Electron. 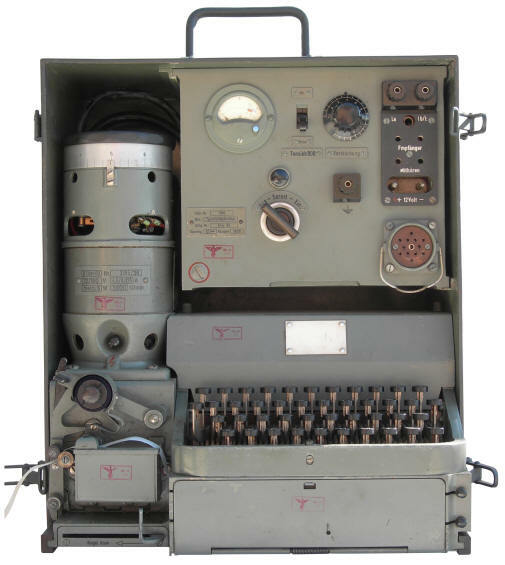 It enthusiastically described a very ingenious German teleprinter from the 1930s and WWII era: the Hellschreiber (see details and articles on my Hellschreiber pages). After attending a lecture/presentation on German radio technology by Arthur, PAØAOB, at the Delft-chapter of the VERON, I decided to try and build my own Hell-printer around 1983. I'm glad that the inventor, Dr. Rudolf Hell, was not named "Dr. Heaven". I might not have been as interested! I got my Master's Degree in Electrical Engineering at the TH Delft in April of 1984. My thesis project was again a combination of electronics and mechanics (and a "personal" DEC PDP-11/23 computer): a sensor-controlled robotic system. Shortly after graduation, I moved across the Atlantic to Florida and started my job at Bendix Avionics in Ft. Lauderdale. Got my Technician Class amateur radio license in 1987 and received the call sign N4SPP. Used cassette tapes for Morse code practice and eventually moved up to Advanced Class in 1989. 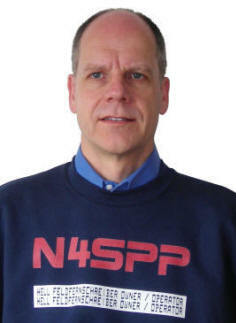 Could have gotten a new call sign (with fewer letters), but I liked "N4SPP" and have kept it ever since. We still had to pass Morse code exams in those days (a good thing in my opinion): 17 words (85 characters) per minute for the Advanced ticket (OK, the exams were receive-only). I lived and worked in Ueberlingen / Germany, on beautiful Lake Constance from late 1989 through 1993. All my furniture and electronics stuff remained in storage in Florida, so no radio activity to report on for that period. Sometime after moving back to Florida, Charles (Chuck), my father-in-law donated his Hallicrafters SX-100 Mk 1A shortwave receiver (538-1580 kHz, 1.72-34 MHz) to me. I didn't really start to use my amateur radio privileges until later, after I had moved to France in 2002. I bought a fine Alinco DX-70TH transceiver (the size of a car radio) on eBay and was in business - finally! Despite, or maybe because of, the limited space I have, I enjoy experimenting with small antennas - indoors and outdoors. My workshop (a converted walk-in closet) - also known as "the clean room"
Not being a particularly extroverted type, I have never gotten into voice/phone mode of operation. 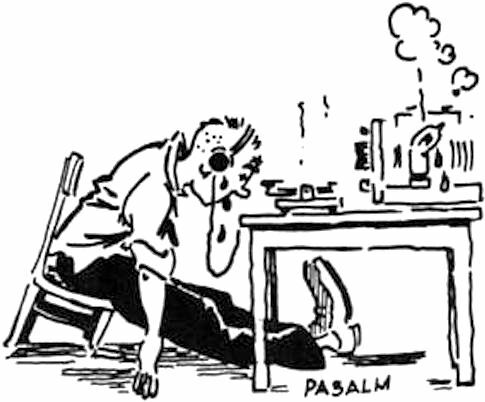 I primarily make my contacts (QSOs) with PC-software for Hellschreiber and Slow Scan Television (SSTV) modes; occasionally I have used PSK31, but as its transmission speed exceeds normal typing speed, one is limited to exchanging predefined messages - how boring! In my opinion, 1930s Hellschreiber is the perfect keyboard-to-keyboard conversation mode. In September of 2008 I finally attended the Annual Hell Meeting for the first time - a social gathering of Hellschreiber enthusiasts in Western Europe. 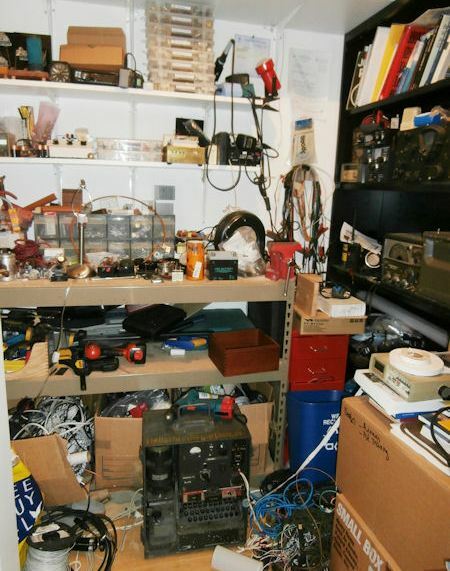 In 2008 it was hosted by Cor, PAØVYL, at his Jan Corver Amateur Radio Museum in Budel (near Eindhoven, The Netherlands). This meeting has been held in the Netherlands for over 30 years! I finally got to meet this group of hard-core Hell-raisers in person. And I had a nice chat with Hans, PAØCX. He made made the incredibly generous offer to entrust me with his Hellschreiber (photo above)! I now have the great pleasure to operate this museum piece from the second World War. Other than several Hellschreiber machines (Feld-Hell, Hell-72, Hell-80, Presse-Hell), I do not have a large collection of equipment - nor do I collect any. And, as they say, the rest is history..! "Dem Funkamateur ist nichts zu schwör!"